Mount Kailash – one of the famous peaks of the Himalayan Range is revered as a sacred site for the Hindus, Buddhist, and Jain religion. The religious importance of the mountain draws many devoted pilgrims from all over the world. Mount Kailash falls in the land of Tibet. Owing to the high-altitude and the ruggedness of this region, few tourist agents organize special trips every year to guide devotees to reach the foot of this mountain. Mount Kailash is part of the Kailas range. It also lies near the source of four major rivers Sutlej, Indus, Brahmaputra, and Karnali river (Karnali is a tributary of Ganges river). The famous Manasarovar and Rakshastal Lake is also located in close proximity to this mountain. Mount Kailash has an elevation of 22,028 feet. For mountaineers, many had tried to explore the summit, but because of the religious significance, climbing Mount Kailash is considered as a sacrilege. During 1980s, the Chinese Government welcomed famed mountaineer, Reinhold Messner, to climb the mountain but he declined. Again in 2001, China allowed a Spanish mountaineering team to scale the peak. However, the idea to climb was vehemently discouraged internationally which eventually led to the final closure to scale this peak. According to the Hindu mythology, Mount Kailash is the home of Lord Shiva and his consort, Parvati. A Hindu visiting this site is said to get their soul cleansed from all the sins made over several lifetimes. As per Tibetan Buddhism, Chakrasamvara or Demchong resides in Mount Kailash. 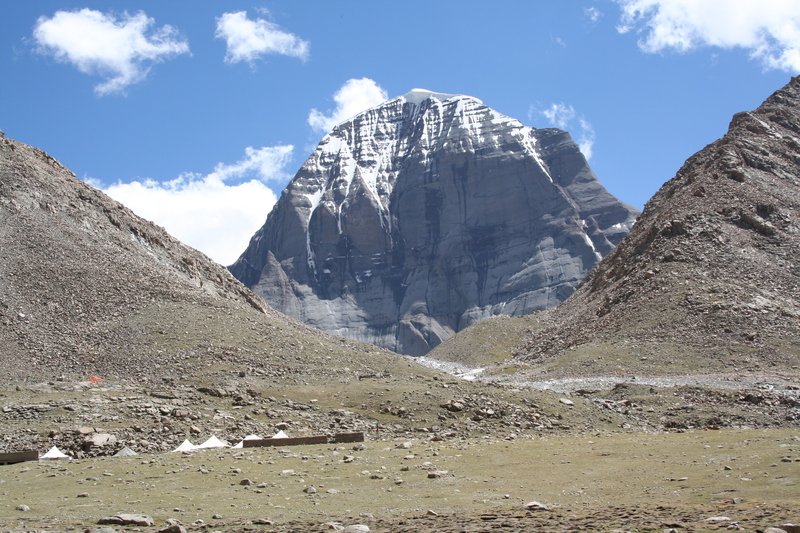 In Jain mythology, Mount Kailash is referred to as Mt. Ashtapada. It is here that the founder of Jainism, Rishabhadeva, finally attained liberation from the cycle of rebirth. The coarse path around Mount Kailash is around 20 miles. For a Hindu and Buddhist pilgrim, the circumambulation occurs clockwise, while for the Jain, the movement is anti-clockwise. The journey around the mountain is usually completed in three days. However, some have accomplished it in a day and for a mountaineer, it will take no more than 15 hours. Though the journey is accomplished by walking on foot, some ardent devotees perform full-body prostrations for the entire stretch. Performing full-body prostration is a difficult task and is only possible for a pilgrim with good health and stamina. For the sake of the devotees, rest areas and kiosks for refreshment have been set up in strategic locations all around this mountain’s base. The journey around Mount Kailash starts from the village of Darchen. For the three days journey, the pilgrims try to reach the Drirapuk Monastery on the first day. The second day is aimed to reach the Zutrulpuk Monastery via the Dolma Pass, and then finally getting back to Darchen on the third day. For a pilgrim, Mount Kailash and Lake Manasarovar are the primary destinations. But if you want to visit this place just out of sheer curiosity, you should visit the adjacent monasteries in this region which are Thailong Monastery, Songchu Monastery, Nyari Monastery, Gyangzha Monastery, and Drirapuk Monastery. All these monasteries bear their own mythical stories along with some splendid works of art on Buddhist culture. Besides, the spectacle of the surrounding mountainous regions adds pure delight to the traveler. Mount Kailash has to be reached from either Lhasa or Kathmandu. From these locations, you need to journey via jeep over the Tibetan plateau. The plateau ranges from 10,000 feet to 16,000 feet in elevation. The journey to the destination takes around four days, camping every night in bitter cold and in harsh weather condition. For a foreigner, you need a guide and a military permit to reach Mount Kailash. However, you don’t need to worry much since the travel agent through which you plan your travel will take care of all necessary requirements. In order to reach Lhasa, you first need to reach China. There are regular flight services to Lhasa from Beijing, Chongqing, Qamdo, Chengdu, Kunming, Shanghai, Guangzhou, Xi'an, Zhongdian, and Xining. The best option would be to reach Beijing because you can avail either train or air services from here. The train to Lhasa from Beijing is probably one of the best journeys that you can undertake. The train covers a distance of 690 miles on high altitude terrain through the barren valleys, finally reaching Lhasa. In order to reach Mount Kailash from Nepal, you first need to reach Kathmandu. The Tribhuvan International Airport is connected with a couple of international destinations along with India. From there, you need to avail another flight to reach Lhasa. The trip to Mount Kailash starts and ends at Darchen. For accommodation, do not expect luxurious hotels in this area. Most of the accommodation here are hostels, where you can live in a dormitory at a very cheap rate. As a foreigner, you need to pay an entry fee to enter the Darchen region to the Chinese government official posted in this area.